﻿ Q116: How can I integrate planyo with my existing website? FAQ Q116: How can I integrate planyo with my existing website? In the settings, you will find the link 'Integrate with my site' which will take you to the integration assistant. There are two integration methods: simple and advanced. The simple method generates HTML code for widgets to be inserted on one or more pages of your websites. This allows your customers to search for available resources, to initiate the booking process, or to see the availability calendar. The advanced method lets you embed a complete reservation system on your website without requiring the users to ever go to the Planyo.com website. Using the advanced integration method, you basically must first embed the planyo plugin/module on a page of your website, and then, you can also add any number of widgets from the last step of the integration assistant, such as: 'make a reservation' button, calendar preview, Google map, availability search box or upcoming availability. All these widgets will open further content on the webpage where you included the plugin. If the customer goes directly to the webpage with the planyo plugin, then the default mode of the plugin will determine which content is shown -- this can be either do nothing (nothing shown), search box, resource listing or upcoming availability. 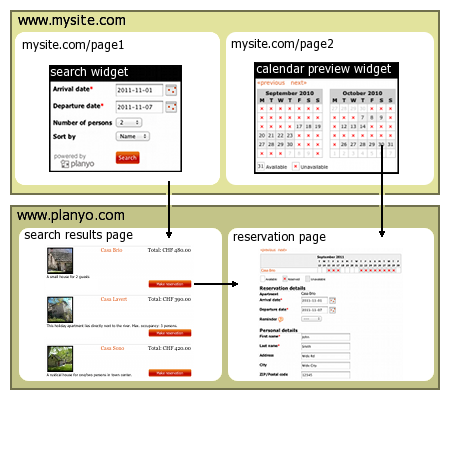 For example, if you embedded the planyo plugin at http://www.yoursite.com/reservations.php, then if you embed a calendar preview widget on your homepage (http://www.yoursite.com/), clicking on a date on this calendar preview will open the reservation form at http://www.yoursite.com/reservations.php. Then let's say you also included a small search box widget on each page of your website. In such case submitting the search will once again open the search results at http://www.yoursite.com/reservations.php. The page with the plugin (/reservations.php) will simply be used to display any planyo-related content, including things like reservation details (link to the reservation details page can be added to the emails sent to the customer), online modifications by customer, or cancellations (also here the links can be very easily added to the emails sent to the customers by using tags from Q204). There are two tutorials which explains in detail how to set up the search functionality as well as the presentation of your resources on your website, using both simple (only widget) and advanced integrations (plugin+widget).